The St. Croix Valley Master Gardeners Association considers grant applications for the following: beautification of public spaces, horticultural education of the public, community gardens, and/or youth horticulture education. Several grants are awarded annually, up to $250 per recipient. Proposals for consideration of grant requests are due March 12, 2018. Grant award winners will be announced on April 30, 2018. The 2018 Community Grant application with instructions and project specifications is available here or email Jenny Brazzale with questions about the grant application. Grant recipients must submit an Evaluation Report to St. Croix Valley Master Gardeners Association following the grant award and project implementation. 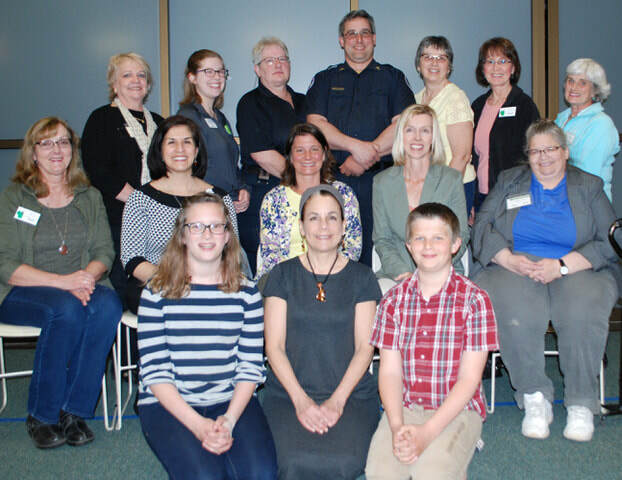 ​The Saint Croix Valley Master Gardener Association is a nonprofit organization that serves the community by providing environmental stewardship and information on horticulture to the residents of Pierce and St. Croix counties. Back row (from left): Liz Whitchurch, New Richmond, raised beds for Our House Memory Care; Katie Marsh, New Richmond, landscaping at Friday Memorial Library; Donna Larson and Kevin Ballman, Ellsworth, landscaping at Ellsworth Area Ambulance Service; Debby Walters, Baldwin, native garden at Bus Loop; Deb Pederstuen, Hudson, garden at Christian Community Homes; and Sandy Madsen, Hudson, garden club at Houlton Elementary School. Middle row (from left): Sharon Reyzer, New Richmond, community garden at St. Croix County Human Resources; Rosa Magnus, Baldwin, community garden at Western Wisconsin Health; Julie Weinberg, Hudson, garden club at Houlton Elementary School; Chris Hanlon, North Hudson, landscaping at North Hudson Elementary School; and Rebecca Strand, Woodville, garden at Norseman Manor. Front row (from left): Rebekah Swanson, Maribel Hokanson, and Willem Lems, Baldwin, butterfly garden at Baldwin Christian School. Not pictured are Phyllis Jaworski, Hudson, garden at E.P. Rock Elementary School; Barb Nelson, Glenwood City, landscaping at Glenwood Public Library and Family Resource Center and curriculum for “Play and Learn in the Park”; Jane Brand, Prescott, landscaping at Pine Glen Cemetery; and Mandy Pfingsten, Elmwood, planters on Main Street.